Check out the Before and After shots of the spot on Old South Road across from Amelia Drive where Palliative & Supportive Care of Nantucket planted over 6,000 bulbs this fall. It has become, quite arguably, the most beautiful spot on Old South Road and makes us smile every time we drive past. Thanks so much to the landscapers, Nantucket New School students, and community members who come together every year to make this happen. We are especially grateful to Champoux Landscape and J & M Landscape Services who coordinate this tremendous effort. Since 2007 PASCON has planted over 60,000 daffodil bulbs across the island in honor and celebration of our program volunteers and as a reminder of hope and renewal to the community. We love helping to make Nantucket beautiful and helping to keep this tradition going. If you would like to help, please click here and make a donation today. Nantucket Daffys are Multiplying Along the Daffodil Weekend Parade Route! 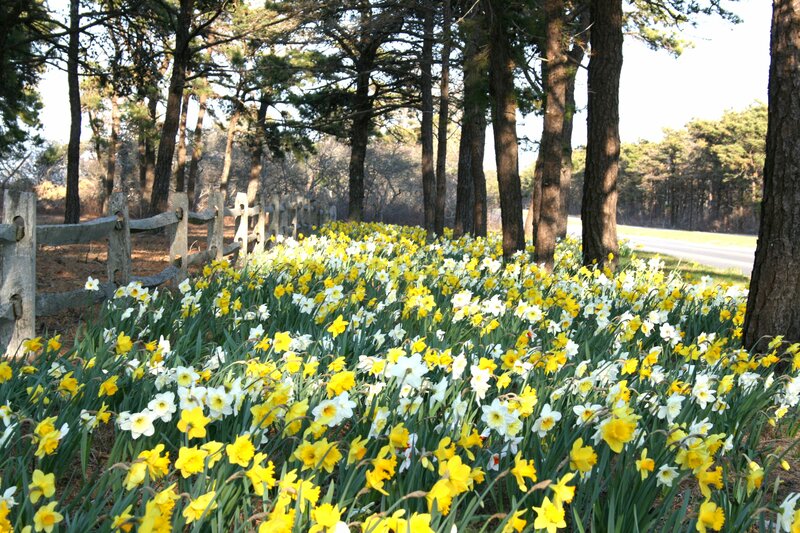 Has anyone noticed that Nantucket Daffodils are multiplying along the Milestone Road ? In 1974, Jean MacAusland enlisted the help of Dave Champoux to plant daffodils up and down the Milestone Road from Monomoy to Sconset. But here is a little known fact…in 2007 the fundraising committee for Hospice Care of Nantucket, now known as Palliative & Supportive Care of Nantucket found a way to continue the plantings and give back to the community in a unique way through a fundraising idea. At their 2007 annual “Dreamcatcher” fundraiser, donations of $250 were collected and in turn, several Nantucket landscaping companies agreed to donate daffodil bulbs and their labor to plant them-the donations went to Palliative & Supportive Care and the bulbs were donated… a fundraising win, win!! The concept was to enhance the daffodils each year along the Milestone Road on the way to Sconset in honor of all the Palliative & Supportive Care volunteers and staff, the caregivers currently working round-the-clock to care for patients and all the patients who benefit every day of the year from the care that Palliative & Supportive Care of Nantucket makes available free of charge here on Nantucket. 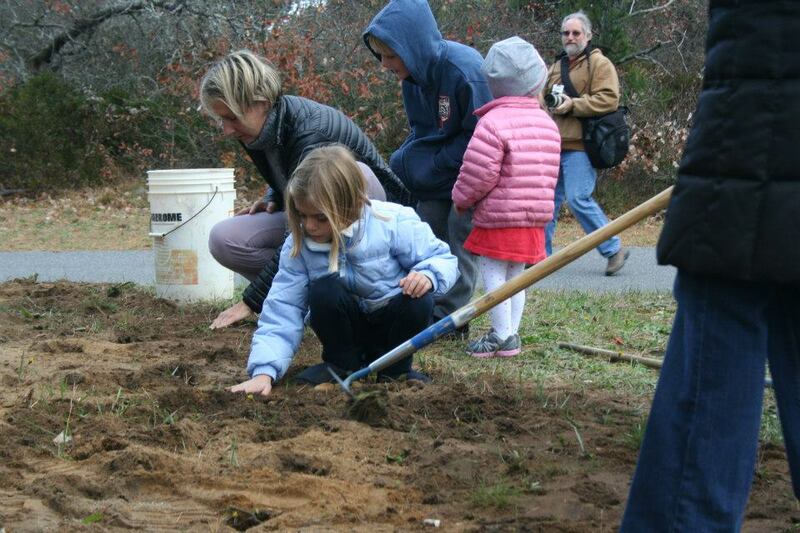 The idea blossomed and for years the students from the Nantucket New School have also joined the annual fall planting as part of their community service commitment. Now some thirty years after Jean MacAusland began her daffy plantings, Dave Champoux of Champoux Landscaping and Mike Misurelli of J&M Landscape Services are at it again and have donated the bulbs(with periodic donations from the Nantucket Garden Club), and stewarded the Palliative Care planting of Daffodils which will takes place each fall. Since 2007, more than 50,000 bulbs have been added and the display in the spring is quite spectacular. Next time you are driving by the “Serengetti” in Tom Nevers or the “V” between New Street and Main Street as you enter ’Sconset, notice how beautiful these new daffodils are or better still, shout out to Dave and Mike and please consider a generous donation to Palliative & Supportive Care of Nantucket for the incredible support and services that they offer to our friends and neighbors here on Nantucket. This vital organization does not receive any public funds or financial support other than your donations which are critical to continuing these services to our Nantucket community. For more information on how you can support this effort, please visit Palliative & Suportive Care’s website and consider attending this year’s Dreamcatcher Dinner and Auction on June 9th at Galley Beach. Michael Getter of DUNE and Buena Vista Winery have come together to offer a 4-course dinner with paired wines to benefit Palliative & Supportive Care of Nantucket on Wednesday, March 13th at 6 pm. Celebrate the last days of winter! Enjoy a fantastic meal, delicious wines, and the company of your friends while supporting a vital island service. Palliative & Supportive Care of Nantucket offers all of its services free of charge to island residents and relies on donations and events like this for funding. Seats are limited and advance purchase is required so make your reservations today! The cost is $125/person. Please call us at (508) 825-8325, email, or visit our Donation Page to reserve your seats. This event is sponsored by DUNE, Buena Vista Winery, Jill Yeagy Bookkeeping, Dennis & Associates, P.C., and Melissa Saunders Meyers. Special thanks to United Liquors as well. Nantucket Bookworks and Mitchell’s Book Corner kick off their “love month” today during which a different nonprofit receives 10% of the sales at both stores each day. Palliative & Supportive Care of Nantucket’s day this year is Tuesday, February 12th so start getting a list together and go shopping on Tuesday. Plan ahead and buy gifts for the whole year! Thanks so much to Bookworks and Mitchell’s for running this inspiring promotion!